Most of my work is in the morning. If I can, I try to stop by a French boulangerie, like Gontran Cherrier in Shinjuku. My go-to coffee place near Tsukiji Market is Turret Coffee. Once in a while I find myself in a new neighborhood and finding a warm breakfast in Tokyo is surprisingly easy. Many fast-food chains will offer up a classic Japanese breakfast with salted and grilled salmon, a small vegetable or sea vegetable side dish, miso soup, pickles, and rice for less than 500 JPY. 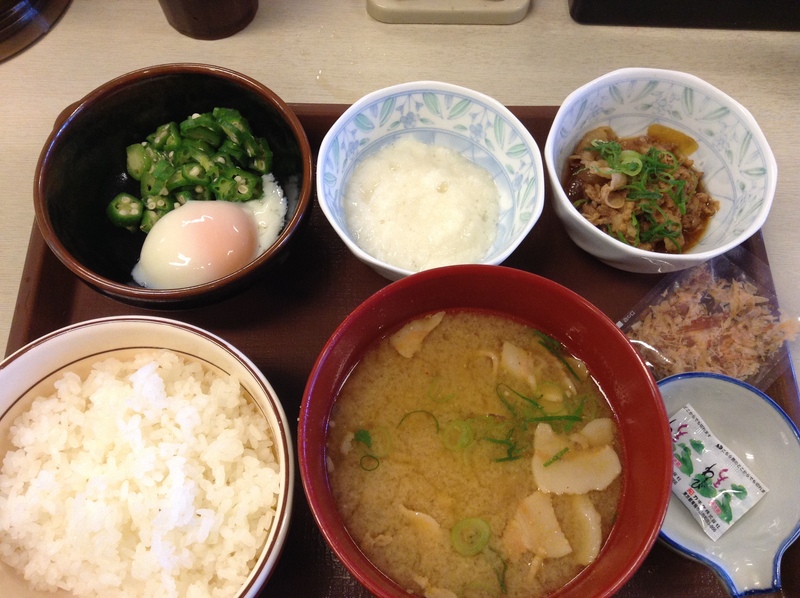 On a recent morning I was near Akasaka and came across one of the fast-food gyūdon chains. What attracted me to this breakfast was the tororo-imo, grated yama-imo (mountain potato) which becomes very slippery and slimy when grated. This with the blanched and sliced okra and soft-boiled egg. The grated potato, okra, and egg are all put over the rice and topped with soy sauce and katsuobushi flakes. I upgraded the miso soup to include thin slices of pork, tonjiru. The top right bowl is the thin-sliced beef and onions cooked in a sweet soy broth, the signature dish for lunch and dinner. A hearty way to start the day. And, not bad for being less than 500 JPY. Yes, this could easily be a dinner as well. Come back to Tokyo Aiste!